New compilation album featuring the stars of the Exit Tunes Academy tour. 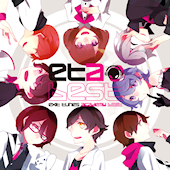 Includes utaite stalwarts like Underbar, Glutamine and Sekihan as well as Exit Trance mainstays DJ Uto, Mayumi Morinaga, and Starving Trancer. Also features the Exit Tunes debut of “Kimi ni Yell o…! (DJ Uto Remix).” Bonus items include a free ticket to the ETA tour, cell phone strap, clear file, and poster.